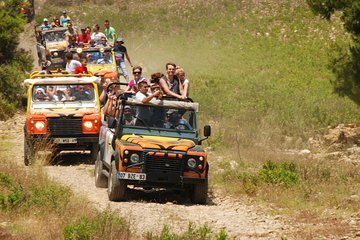 Experience the Taurus Mountains on an off-road safari and white-water rafting trip that explores thick pine forests and the scenic Koprulu Canyon. This full-day adventure tour includes all equipment, lunch, and round-trip transport from Belek-area hotels, and you’ll run Class II rapids that are suitable for even beginning rafters. Start the day with pickup at your hotel in Belek, Kadriye, Serik, or Bogazkent for departure: the pickup schedule depends on your location, and the supplier will confirm exact times following booking. From the coast, it’s about a 25-minute drive to Tasagil, where you’ll transfer to a 4x4, open-top vehicle for the rugged trip into the mountains. Set out along roads that wind through thick evergreen forests, and splash across mountain rivers. You’ll spot medieval ruins along the way, and take a break to cool down and wash off the dust at a scenic river swim spot. Arrive at the rafting base camp by noon, then fuel up for the river trip with a lunch of grilled chicken, pasta, rice, salad, and fresh fruits. Suit up in full safety gear (be sure to bring rubber soled shoes or sneakers for this trip), then learn the basics of paddling technique before you launch the boats. Enjoy dramatic scenery and mountain sunshine on the 8-mile (13-km) paddle to the first rapids, where you’ll splash your way through a series of bumps and swirls (there are no dry bags on the raft, so please leave non-waterproof items at home). The convoy of off road vehicles will meet you at the end of the rafting trip, where you’ll dry off and begin the return trip to Tasagil. This tour concludes with drop-off at your hotel.